This year’s Canadian Evaluation Society (CES) conference was held in Calgary, Alberta and had a theme of Co-Creation. As always, I had a great time connecting with old friends and making new ones, learning a lot, and getting to share some of my own learnings too. As I usually do at conferences, I took a tonne of notes, but for this blog posting I’m going to summarize some of my insights, by topic (in alphabetical order) rather than by session as I went to some different sessions that covered similar things. Where possible, I’ve included the names of people who said the brilliant things that I took note of, because I think it is important to give credit where credit is due, but I apologize in advance if my paraphrasing of what people said is not as elegant as the way that people actually said them. Anything in [square brackets] is my thoughts that I’ve added upon reflection on what the presenter was talking about. I didn’t see as many things about complexity as I usually do at evaluation conferences. Once upon a time, evaluation was about “did you achieve your objectives?” but now we also think about the side effects too! (Jane Davidson). Bower & Elnitsky talked about having to distinguish between evaluation/quality imrpovement/data collection/clinical indicators/performance indicators (and how, in their view, these aren’t different things) and to talk to their client about how evaluation adds value. This struck a chord with me as it was similar to some of the things that my co-authors and I talk about in a paper we currently have under review in the Canadian Journal of Program Evaluation. Sarah Sangster felt that evaluation is like research, but more. She described how evaluation requires all the things you need to do research, but also has some things that research doesn’t (e.g., some evaluation-specific methods). She talked about how ways that people sometimes try to differentiate evaluation and research are really shared (e.g., evaluation is often defined as referring to judging “merit/value/worth”, but that research does that too (e.g., research judges the “best treatment”). [Some of the things she talked about were things that my co-authors and I grappled with in our paper – such as how research is a lot more varied than people typically give it credit for (e.g., participatory action research or community-based research stretch the boundaries are traditional research in that the questions being explore come from community instead of from the researchers and the results are specifically intended to be applied in the community rather than just being knowledge for knowledge’s sake). The CES is updating its list of evaluation competencies – those things a person should know and be able to do in order to be a competent evaluator. The evaluation competencies are used by the society to assess applicants for the Credentialed Evaluator designation – people have to demonstrate that they’ve met the competencies. The competencies are being revised and updated and the committee is taking comments on the draft until June 30, 2018. They expect to finalize the new competencies in Sept 2018. The CES is also looking at renewing its ethics statement, which hasn’t been updated in 20 years! I went to a session where we looked at the existing statement and it clearly needs a lot of work. The society is currently doing an environmental scan (e.g., looking at other evaluation societies’s ethics guidelines/principles/codes/etc.) and consultations with stakeholders (e.g., the session I attended at the conference) and plan to have a decision by the fall if they are going to just tweak the existing statement or completely overhaul it. They hope to have a finished product to unveil at next year’s CES conference. There was a fascinating panel of 3 mayors who were invited to the conference to talk about what value evaluation can add for municipalities. None of the mayors had even heard of the Canadian Evaluation Society prior to being invited to the conference, so we definitely have our work cut out for us in terms of advocating for evaluation at the municipal level. There is definitely lots of evaluation work that can be done at the municipal level and it would be worthwhile for the society to educate municipal politicians about what we do and how it can help them. The mayors were open to the idea of using evaluation findings in their decision making. There was a suggestion that there should be a panel of evaluators at the Canadian municipalities conference, just like we had the mayors’ panel at our evaluator conference, and I seriously hope the CES pursues this idea. Evaluators affect the things they evaluate. The act of observing is well known to affect the behaviour of those being observed. As well, we know that “what gets measured gets managed,” so setting up specific indicators that will be measured will cause people to do things that they might not otherwise have done. This is an important thing that we should be discussing in our evaluation work. Several of the people speaking about indigenous evaluation talked about the need for indigenous-led evaluation. We have a long history of evaluation and research in indigenous communities being led by non-indigenous people where they take from the community, don’t contribute to the community, don’t ask the questions that the community needs answered, don’t understand things from the communities’ perspectives, impose Western view/perspectives/model, and then leave the community no better off than before. “How do we ensure evaluation is socially justi, as well as true, that it attends to the interests of everyone in society and not solely the privileged” (House, 1991 – cited by Kate McKegg). 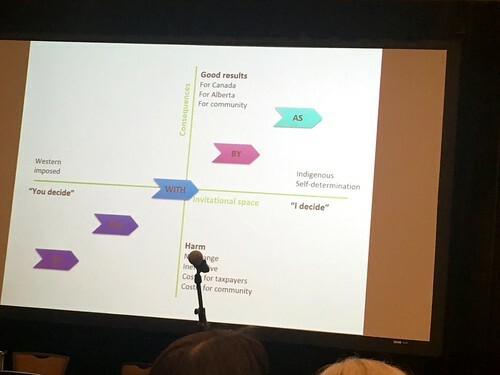 “Culturally-responsive evaluation seems to be about giving “permission” to colonizers and settlers to do evaluation in indigenous communities” (Kate McKegg). “Sometimes the stories we are telling are not the stories that need to be told.” (Larry Bremner) [Larry was talking about the ways in which evaluation can further perpetuate injustice against, and further ignore and marginalize, indigenous people, thorough what we do and do not study.] Is our own working maintaining colonial oppression? “Trauma is never far from the surface in indigenous communities.” Larry Bremner. The lifespan of indigenous people is 15 years less than non indigenous people. There is a lot of diversity among indigenous people in Canada: 617 First Nations, as well as Inuit and Métis; 60 languages. How can non-indigenous people be good allies? During the opening keynote, an audience member asked how non indigenous people can learn if it’s not indigenous peoples’ responsibility to teach non indigenous people. The panelists noted that indigenous people are a small group who first priority is to do work to help their communities – expecting them to educate you is to put a burden on them that is not their responsibility. Kate McKegg noted that indigenous people have been trying to talk to non indigenous people for years and we haven’t listened to them. She suggested that we can work with other settlers who want to learn – there is lots available to read, to start. Nicole Bowman noted that observation is how we traditionally learned and it is part of science to observe – do some observing. Larry pointed out that indigenous people have taught their ways to others before and people have taken their protocols and not used them well – why should they give non indigenous people more tools to hurt indigenous people? 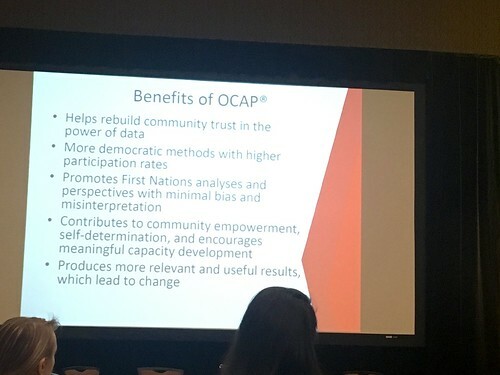 Lea Bill from the First Nations Information Governance Centre spoke about the OCAP® principles, which refers to Ownership, Control, Access, and Possession of data, in that First Nations have rights to all of these. [I have learned about OCAP® before, but hadn’t realized until I saw this presentation that it was a registered trademark). All privacy legislation is about protecting individual privacy rights, but OCAP® is about collective, community rights. Something I’ve been interested lately is how people from different disciplines use words differently. Two disciplines might use the same word to mean different things, or they might use different words to mean the same thing. One of the sessions I attended was about a glossary that thad been created to clarify words/phrases that are using by financial/accounting people vs. evaluation people. Check out the glossary here. 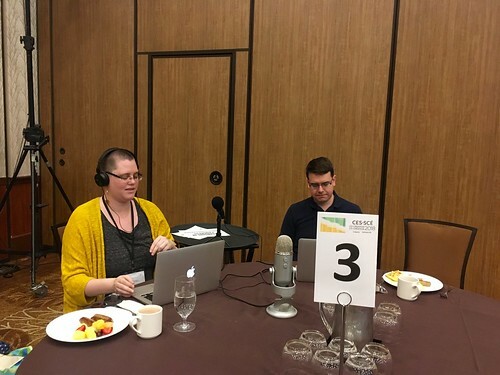 I attended a thematic breakfast session that was a live taping of an episode of the Eval Cafe podcast. It was a chance for a group of us to reflect on what we’d learned about at the conference. You can check out the podcast here. Research “are hospitals public places?” for the purposes of observations. Closing Keynote Panel: Reflection on Co-Creation Conference 2018 by CES Fellows – Our rapporteurs, realists, and renegades. This entry was posted in evaluation, event notes and tagged Canadian Evaluation Society, CES, CES 2018, conference, conference notes, evaluation, notes. Bookmark the permalink.